Get out your forks and pocket protectors for this week’s episode with Dr. Gabrielle Lyon as we dive deep on nutrition, debunk some common myths around protein requirements and meal timing, and explain why more doctors should follow Dr. Lyon’s lead and practice Muscle Centric Medicine. Dr. Lyon is a board-certified Osteopathic Family Practice physician with a research fellowship in Nutritional Science and Geriatrics at Washington University in St. Louis.Prior to her foray into medicine, Dr. Lyon was a national semifinalist in Fitness America, a professional fitness model, and a nationally ranked figure competitor. We sat down with Dr. Lyon during last weekend’s Strong New York event for this dense and informative conversation that finally debunks the common myths that we need to eat every 2-3 hours or that we can only digest 20-30 grams of protein in one sitting. We also explore Muscle Centric Medicine, how muscle mass can improve health, reduce disease risk (Diabetes, Alzheimer’s, etc) and improve longevity. As Dr. Lyon point’s out, we’re not just over-fat, most of the population is grossly under-muscled. And of course, we won’t leave you hanging without a prescription. We’ll give you the tools to optimize your muscle building efforts and dial-in your protein intake, including amounts and timing by looking at something called the Leucine Threshold. Here’s what you need to know about the Leucine Threshold. 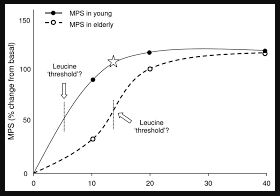 The “threshold” is the minimum amount of Leucine needed to stimulate protein synthesis. A few terms for those without a masters degree in Human Nutrition: Protein synthesis means muscle building and Leucine is one of the three branched chain amino acids (BCAAs) that are crucial for skeletal muscle. Our individual threshold to trigger this muscle protein synthesis varies from person to person, but also increases as we age. In other words, the older we get, the more protein we need. As the amount of Leucine needed to trigger protein synthesis, it’s somewhere between 2.5-4 grams for the average person. In the chart below, you can see how much of our common protein sources you need to ingest to acquire this amount of Leucine (about 6 whole eggs or of lean ground beef, for example. During a tornado scare in Illinois while studying nutrition Dr. Lyon realized her path to service needed to be through the medical system. Muscle is the largest organ in the body, the most metabolically active organ and the key to overall wellness and optimization. Know your people and learn to identify their and your own weaknesses. Show up, know your stuff and give 110%. You’ll break through stigma and preconceptions every time. Strength is having multiple highly function domains(mental, physical, spiritual).